It’s the greatest superhero fight ever! Not really but the title made me think of superheros. And it put a hilarious image in my head! Anyhow, in our last post from Colten’s Myelo Clinic check, we mentioned that there was slight concern about his head shape. Between that and the fact that his head circumference started going back up, this Momma is on high alert. 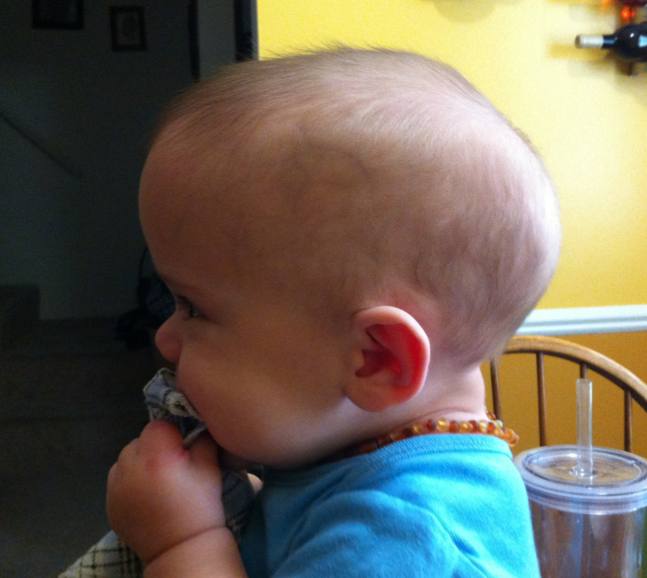 Measuring his head daily and trying to find out more about this new word they used: craniosynostosis. And the internet is either giving me clear proof that I am right to be concerned, or it’s fueling my neurotic behavior unnecessarily. 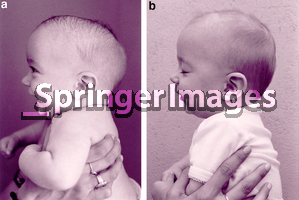 One type of craniosynostosis is scaphocephaly. This is when the early fusing takes place in the saggital suture – the seam that runs from front to back of the top of the skull. When this happens, it forces the brain/head to push out the front and back since it cannot expand evenly throughout the skull. Based on a measurement chart I found online, Colten’s Cranial Index is about 68% (remember, this is Richard and I measuring with his well-designed but not official head calipers… we made a device out of kabob skewers. Now I’m wishing we had a picture. Maybe we’ll re-enact it again tomorrow. This percentage is considered moderate scaphocephaly. Mild is 70-75% and normal is 75-80%. I put a call into Mott’s pediatric neurology unit today because of these findings. It was mentioned casually at the clinic appointment last week but after looking more into it, I’m kind of surprised they didn’t measure him right then and there. Just as a precaution. So hopefully I get a call back tomorrow in regards to who we need to talk to more about this. They did mention at the appointment that they are not a helmet-first department. Frankly, I would prefer to avoid another surgery already and am interested to learn the rationale behind a surgery-first approach. If that’s even needed. Right now I just want someone to take an official measurement and say either “here’s the next step” or “stop being neurotic”. Actually, I’m not sure I need to use neurotic at all. My mom reminded me that when she saw him a couple weeks ago, she had even remarked about his head shape seeming more off than before. I had not taken much to the comment because I just assume it’s going to be a funny shape due to the Chiari Malformation. However, that is not – or should not, be the case. I just kind of assumed that if the brain was a little off-kilter in positioning, it would cause the skull to form differently. In a Chiari Malformation, however, the cerebellum is pulled downward. So if anything, the skull would be flatter. But I couldn’t locate anything regarding skull shape and Chiari in my brief browsing. So combine that with the other revelations at his appointment and you have… not-so-neurotic mom? This is a picture from today of Colten’s head, side view. The lighting makes it slightly hard to see but he has a flat part at the top of the back and then it really rounds out away from his neck – a very oblong shape, not a round shape, as is typical. His forehead is starting to protrude outward again, as it did before his shunt was placed, as well. 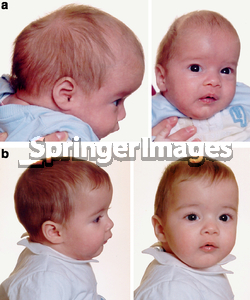 These are a couple of pictures (from this website) of children before/after treatment for scaphocephaly. Colten looks very much like the 2nd picture, in my opinion. As I said in last week’s post, there’s a lot of crazy images from the surgery that some of these kids need. That surgical technique has been replaced by a much less invasive procedure in many hospitals. And sometimes helmets can resolve the issue. So we will wait to see what happens. In a weird way, I wanted to post this so I can look back and say, “Aha! I knew I was right!” However, I would MUCH rather be wrong! This entry was tagged Chiari II, cranial index, craniosynostosis, head circumference, neurology, scaphocephaly. Bookmark the permalink. I personally think he looks perfect ’cause Colten’s smile says it all……………. I thought Colten’s head had changed shaped as well, a couple weeks ago, but thought it was part of his issues. I didn’t know if it was an change to be concerned with. I’m glad you have contacted Motts. I don’t think you’re neurotic at all. All of us have to be advocates for our children. You’re doing an exceptional job, don’t doubt yourself. Brynn’s cousin Nicky had cranal surgery because his head was not developing properly, he had the protruding forehead much like the picture you posted from the website. I don’t know if it was the same root cause but he ended up having surgery at Mott’s and the change from before to after is pretty drastic. He is a happy, smiley, growing kid just like Colten.